I love it when a film can expose me to something—a historical figure, a place, an idea, an event—that I would have had no idea about otherwise. That’s exactly what Genius did. It focuses on the relationship between Max Perkins (Colin Firth)—“editor to the literary stars,” if you will—and his full-of-life client, the somewhat eccentric author Thomas Wolfe (Jude Law). Although I’m slightly embarrassed to admit this, I feel it’s important to note that if, like me, you’ve never read Wolfe’s novels, you won’t be at a disadvantage; the point of the film is how much the two men needed each other in very different ways. Wolfe was verbose, poetic, wild and rambling… whereas Perkins, was… well… let’s just say that Firth was the perfect actor to portray such a stuffy, serious and kinda boring devotee to the art of editing. Perkins reins Wolfe’s writing in and helps him publish two highly lauded literary masterpieces. 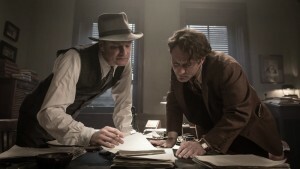 It’s impressive that first-time director Michael Grandage and his leading men somehow manage to make the not-at-all-exciting process of editing actually compelling in a few key sequences, including one that shows how Perkins pushed Wolfe to cut down pages of descriptive text into just three standout sentences. In return, Wolfe shows Perkins how to loosen up and enjoy life more. While the film is set in the dreary 1930s and is dominated by damp gray and brown tones, Law plays Wolfe as the desperate burst of color Perkins (and the world?) needs in order to reexamine both his family life and his career. In the opening scene of the film, first-time director Grandage depicts this quite literally, with a bustling Manhattan in black and white—until Wolfe appears. While I appreciated Law’s energy and ability to translate Wolfe’s exuberance onto the big screen, there was one part of his performance that I just could not get past: his Southern accent. Law sounded exactly—and I mean, exactly—like Andrew Lincoln’s Rick Grimes from the TV series The Walking Dead. It was uncanny. And since I’m a huge Walking Dead fan and think Lincoln (who’s a Brit, like Law) overdoes it with his accent as well, the similarity hit me every time Law opened his mouth, and I was taken out of the film a little bit. I also found the wonderful Laura Linney and Nicole Kidman to be criminally underused. Linney’s Louise Perkins (Max’s wife) seemed like an afterthought, added into the script in an attempt to make Max more three-dimensional. It didn’t work. And Kidman’s Aline Bernstein—Wolfe’s married, controversial lover—seemed like a character that a whole separate film could’ve revolved around, yet in Genius she, too, seemed awkwardly wedged into wherever the story needed more drama. Genius is a classic example of how a film’s subject matter can overcome some of its flaws in direction. I mean, Perkins was the editor for and good friend of not only Wolfe, but also Ernest Hemingway and F. Scott Fitzgerald (who pop up in a few scenes and are played by Dominic West and Guy Pearce, respectively)! That’s crazy! Maybe it’s because I’m also a writer and editor, but I was pretty transfixed by this film, and I think that anyone who usually enjoys “true story” dramas (another Firth film, The King’s Speech, came to mind while I was watching Genius) will be, too. The Bottom-Line? Director Michael Grandage could’ve used his female stars more powerfully—and the whole film smells of Oscar Bait—but the opposites-attract friendship between Perkins and Wolfe is the stuff of literary lore and is more than enough reason to seek out Genius.